In the world of tailoring, your posterior (bottom, bum, arse, etc) is actually known as your “seat”. We still make our trousers using traditional methods, with inlays at the centre back and inleg, that allow us to achieve the perfect fit for your seat, even if our tailors have to make a few tweaks. The trousers drape smoothly, without excess cloth or giving you a wedgie and they fit you perfectly around the waist. 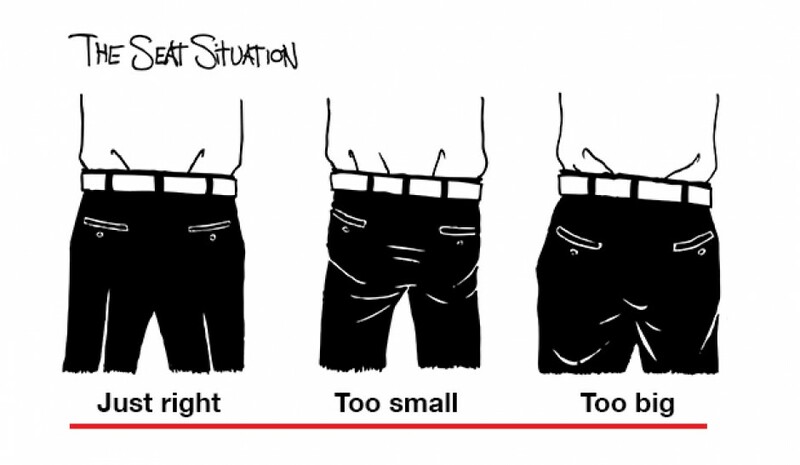 The trousers fit perfectly around the waist but are either too tight across your seat or they give you a wedgie. We can fix either of these problems by letting out the inlays to give you more room, or you can go up a size to give your seat more room and take the waist in so it stills fits you perfectly. The trousers fit perfectly around the waist but are too big around your hips (and almost certainly through the thigh). We can either take the trousers in, or you can go down a size (which makes the trouser slimmer around the thigh) and we’ll let the waist out so that it still fits you perfectly.